Cordelia McGee-Tubb ’11 who is now a software development engineer in San Francisco, CA, for Salesforce.com, an enterprise cloud computing company that distributes business software. Arjun Agarwala ’10 who, following an internship at Citigroup’s Investment Bank in New York City, in the summer of his junior year, will be returning to them full time. Arjun will serve as an analyst in the investment bank’s telecommunications coverage group. Zachary Pattison-Gordon ’10 who is now an application support programmer for Kenshoo, a global innovator in search engine marketing technology. Sonia Roberts ’10 who presented both a talk and poster at the Society for Integrative and Comparative Biology conference in January on her biorobotics research with Professor Long. Philip Tully ’10 who will be studying Computational Neuroscience and Neuroinformatics in Sweden starting in September funded through the Erasmus Mundus Joint Doctoral Fellowship: European Study Programme in Neuroinformatics (EuroSPIN), at the Royal Institute of Technology in Stockholm, Sweden, and the University of Edinburgh in Edinburgh, UK, to get a joint PhD in Computer Science. Nikki Rosard ’08 who is now a Quality Assurance Engineer at Lime Wire, LLC in Manhattan, NY. David Dunne ’07 whose company, Riot Games, just received two more Game of the Year Awards from IGN, for Best Multiplayer Game of 2009 and Best Strategy Game of 2009. Tai Shimizu ’07 been spending all his after-work hours since January working on his iPad photo editing application, Filterstorm, which reached number 1 in the photography section of the iPad app store (as well as number 39 in the top 100 free applications) in early May. If any of you have iPads, Tai asks that you download it and try it out! 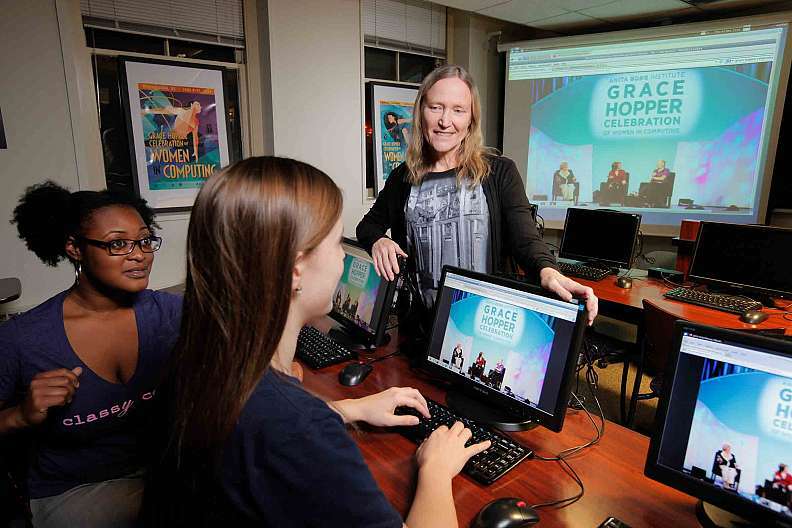 Associate professor Jennifer Walters (standing) and her students participate in the Grace Hopper Celebration of Women in Computing. Read more. See slideshow View gallery.